Have you ever dreamed of escaping your life and sailing off into the sunset? 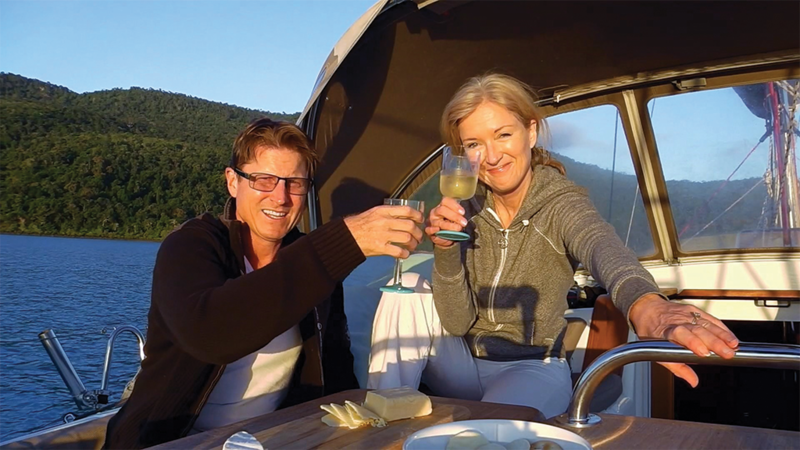 The new series Living the Dream is all about husband and wife Dan and Maxine doing just that when it premieres Saturday, January 27, at 3.30pm on Channel Nine. Dan and Maxine are rookie sailors who quit their stressful TV jobs, buy a boat and sail a thousand nautical miles from their home in Sydney to explore the Whitsunday Islands for five months. The result is a unique piece of film making that is part reality show and part travelogue and showcases a disarmingly honest account of the meltdowns, breakdowns and nerve-wracking close calls they encounter. Highlights of their five-part adventure include close encounters with some of Australia’s majestic water mammals, helping out with a turtle rescue, and a visit to Shaggers Rendezvous, known as “schoolies for old people”. Living the Dream is sure to be an inspiration for lounge lizards everywhere to get up off the couch and follow their dreams. Strong winds and a relentless current force rookie sailors Maxine and Dan to turn back on Day One of their great sailing adventure. Undeterred, Dan pushes on without Maxine, overcoming a mechanical problem with the sail drive to finally reach the Whitsunday Islands. Reunited at Airlie Beach, the couple have a heartwarming encounter with a whale and her calf and Maxine takes a dip, ignoring warnings of hammerhead sharks. It’s non-stop drama for rookie sailors Maxine and Dan who run aground in Abell Point marina, narrowly avoid hitting a whale, and are forced to pull their 13-metre yacht Wildflower out of the water to deal with the nagging mechanical problem. Maxine helps to rescue a turtle and Dan swims with the batfish before taking a pounding in the Airlie Beach Yacht Race. The intrepid rookies venture way beyond their comfort zone to race at Hamilton Island with surprising results. Dan submits to a hairdresser in a bikini at the Shaggers Reunion and more mechanical problems leave them up a creek without a paddle. Mechanical problems continue to dog the rookie sailors, a turtle release lifts their spirits, and Maxine fails a crucial sailing test. Dan reveals his secret fears on the eve of their sail home and a storm leaves them stranded in Mackay. Fear and apprehension bubble beneath the surface as the rookies continue their sail home. Navigating the Sandy Straits of the Great Barrier Reef causes Dan to have an emotional meltdown and all hell breaks loose at 3.00am when sails and lines get tangled. Finally, a cavalcade of dolphins welcome the weary pair home in Sydney with tears all round.